Arrested man 'wanted to shoot Trump' Jump to media player A Briton who tried to grab a police officer's gun at a Donald Trump rally in Las Vegas said he wanted to shoot the US candidate, court papers say. Trump campaign boss fired Jump to media player Corey Lewandowski, the campaign manager for the presumptive Republican presidential candidate Donald Trump, has been fired. Donald Trump, the Republicans, and wooing white America Jump to media player Donald Trump's popularity with white America doesn't guarantee him the White House. Trump 'says what we're thinking' Jump to media player Trump supporters say they back the presumptive Republican nominee because he's saying what's on their minds. 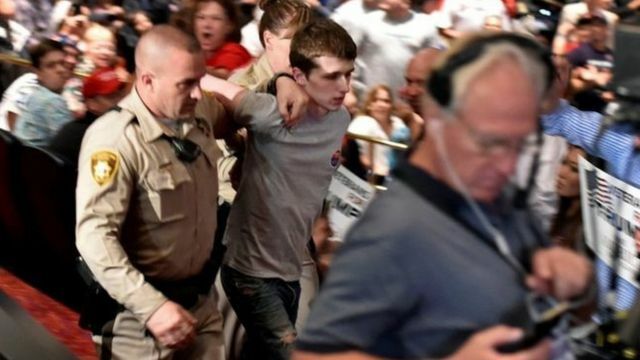 A Briton who tried to grab a police officer's gun at a Donald Trump rally in Las Vegas said he wanted to shoot the US candidate, court papers say. Michael Steven Sandford, 20, did not enter a plea when he appeared before a judge in Nevada and was remanded in custody until a hearing on 5 July.